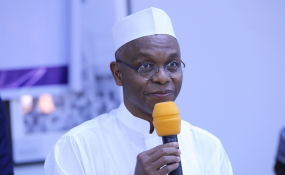 Kaduna — Kaduna State Governor, Mallam Nasir el-Rufai Saturday held a townhall meeting with some Christian leaders under the aegis of Pastors United for Change Association (PUCA), asking them to support his re-election. He held the meeting some weeks after he defended his decision to run with a Muslim running mate, Dr. Hadiza Balarabe, saying 67 per cent of Christians would not vote for him, even if the Pope was his running mate. At the meeting yesterday, the governor said his decision for a Muslim running mate was not based on religion and ethnicity, but on purely capacity to deliver. He said the appointment of all those working with him were based on competency to get results, not minding their tribe, religion. El-Rufai said his target "is to end the religious, ethnic division and unite the people of the state. In my life I have never worked with people based on religious and ethnic consideration. Don't look at what people said but what I have done in the past. "Go through my records and see what I have done. On the issue of my running mate, we are encouraging women participation in politics. She is a competent woman. Only Kaduna State has male/female governorship ticket in northern Nigeria. "Late Prof. Andrew Nok, former Commissioner for Education brought Dr. Hadiza Balarabe when we were looking for someone that can revive our primary health in the state and she performed excellently well. "I do not know her before. Her choice as running mate has nothing to do with religion. I am confident that my running mate will run the state effectively and will be fair to all in the state even if I am not around. "When you get into office politics stop, you must be fair to all. Check our records in the last three years and six months, we have worked. We built, repaired primary, secondary schools. We fixed our primary health centres. "I am human and I can make mistakes like any other person. I will be fair to everybody. We must unite our people for progress. I want Kaduna state to interact on the basis of humanity not religion and ethnicity. In his remarks, chairman of PUCA, Apostle David Adeniran said with the explanation by the governor, they had understood that the he wanted a united Kaduna without religious, ethnic consideration. According to him, I believe many of us will go home with a new thinking that something good is happening in Kaduna. This is a new Kaduna state.